Ocicats are sociable, affectionate, and very intelligent. Despite their wild appearance, they tend to be friendly and easy going. The Ocicat is a relatively recent breed. 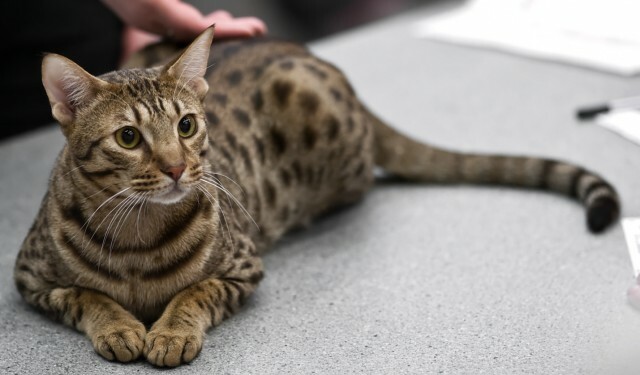 The first Ocicat was born in 1964 when breeder Virginia Daly accidentally produced a spotted kitten while trying to create a Siamese with Abyssinian markings. Daly started with Siamese and Abyssinian parents, and then bred a kitten from each subsequent generation to a Siamese, ending up with a surprising result in the third generation – a kitten with golden spots on white fur. Daly’s daughter, thinking the kitten looked like an ocelot, named it Ocicat. Other breeders soon took up the challenge of refining the breed, mating Ocicats with American Shorthairs, which gave the modern Ocicat its strong, hearty constitution. In 1987, the Cat Fanciers’ Association officially recognized the Ocicat, and the breed continues to rise in popularity. The Ocicat has a wedge-shaped face with a short nose, almond-shaped eyes that angle slightly upward, and widely spaced ears, in some cases tufted. Its body is broad-chested and muscular, with long legs and a long slender tail. The ocicat’s coat is short and glossy, with dark spots on a light background. The spots give the cat a wild appearance. There are also darker “mascara” lines around the cat’s eyes and an M-shaped marking on its forehead. Ocicat background coats may be a variety of colours, including blue, blue silver, chocolate, chocolate silver, cinnamon, cinnamon silver, fawn, fawn silver, lavender, lavender silver, silver, and tawny, overlaid with darker spots. Ocicats may also have solid coats or stripes instead of spots. While not qualified for cat shows, these cats have the appealing Ocicat temperament. Ocicats tend to be strong and solidly built, which makes them feel heavier than they look when lifted. A medium to large breed, adult male Ocicats weigh between 11 and 14 pounds, and females between 6 and 10. Ocicats tend to be affectionate, friendly, and highly active. Extroverted and curious, most Ocicats are open to new experiences and not afraid of greeting strangers. They are also more inclined to get along well with other cats, dogs, and children than cats of most other breeds. Ocicats tend to be playful and exuberant. They like to explore their surroundings in depth, and many also follow their owners from room to room. Some even enjoy riding around on a person’s shoulders. Ocicats are also more receptive to learning tricks than most other cat breeds, including dog-like activities such as fetching, responding to voice commands, and walking on a leash. Ocicats are extremely sociable and should not be left alone for long. They do better in households where there are people or other pets to interact with at all times. There are no genetic health problems associated with the Ocicat. With proper care, Ocicats are among the more long-lived cat breeds. The price of Ocicat kittens varies depending on markings, bloodlines, and other factors. Cost usually ranges between $500 and $900. See How to Find Purebred Kittens for tips on locating reputable breeders. Mattern, Joanne. (2003). The Ocicat. Mankato, Minnesota: Capstone Press. McKee, Bill. (14 June 2009). 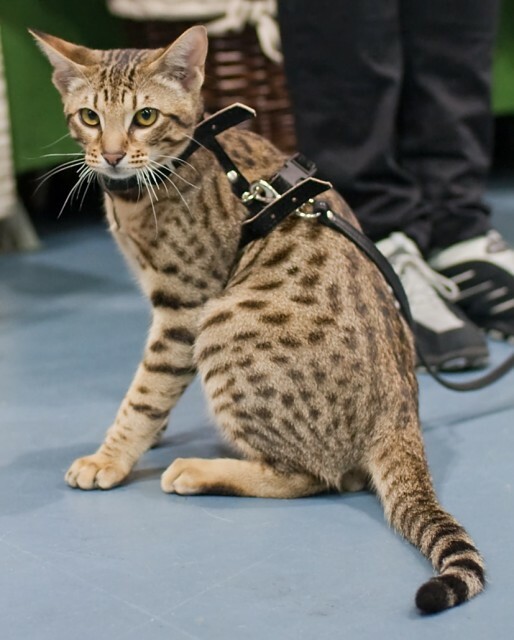 “Breed Profile: Ocicat.” Cat Fanciers’ Association, CFAinc.org.